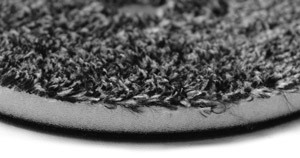 A blend of both cutting and polishing fibers creates the perfect pad for each step of detailing - in one! Thanks to the chemical and heat resistant adhesive that holds the Buff and Shine Uro-Fiber components together, these microfiber pads excel in durability and hold up under even the toughest polishing sessions. Available in 5 different sizes, you’ll be hard pressed to find a paint polishing or correcting task that CAN’T benefit from a treatment with Buff and Shine Uro-Fiber Pads.